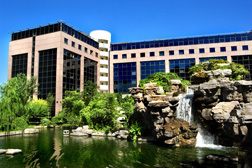 The Kempinski Hotel Beijing Lufthansa Center is like a city within a city. From the minute you enter the striking red and black reception lined with bamboo trees in attractive red pots, with a soaring glass atrium, you feel like you are in another world. The hotel provides a window on the culinary world with seven international restaurants under the responsibility of Executive Chef Wolfgang Schmelcher. We dined on Roast Beijing Duck at the Dragon Palace Restaurant which features contemporary Chinese and Cantonese cuisine in an elegant setting. We had a wonderful lunch at Kranzler's Restaurant & Bar their new trendy buffet and a la carte restaurant that features a large open kitchen. We enjoyed tea at the Rendezvous Bar & Lounge, which is the perfect place to enjoy afternoon tea or sip a cocktail and listen to piano music in the evening. We had an authentic Italian dinner at their casual restaurant Trattoria La Gondola. Kempi Deli is a delicatessen with homemade bread, pastries, sausages, and ice cream, and when we saw the fresh pretzels in the woven baskets on the shelves, we had to go in and purchase a few. Paulaner Brauhaus is like traveling to Bavarian with a German menu, microbrewery where the brewmaster makes up to 500 liters of beer per day, and music in the evening. Honzen Restaurant is their Japanese restaurant and features a Japanese and Sushi menu. There is a wide range of room and suite categories, suites include: (1) Presidential, (4) Diplomatic, (18) Salon, and (16) Junior suites, and rooms include: (109) Executive, (147) Deluxe, (219) Superior, (8) Superior rooms equipped for disabled guests and (4) Female Traveler rooms. Edward F. Nesta and I stayed at the hotel in October 2006, in an Executive room, where we had personalized butler service. 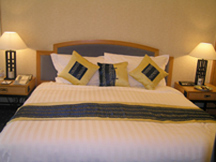 Our well-appointed room featured a king bed with white duvet adorned with yellow and blue silk decorative pillows and a pretty yellow and blue silk runner. There were nightstands with Asian style wood lamps with creamy lampshades on either side of the bed with control panels to operate the lights and control the air conditioning, as well as a clock radio. Two arm chairs and an ottoman flanked a round glass table with an exotic floral arrangement of stargazer lilies, dendrobium orchids, and birds of paradise in a square vase, and a partner desk with two chairs where I used my laptop or wrote "wish you were here" postcards to friends. Other room amenities included a Philips flat screen television, Internet access, mini-bar, and a coffee maker. There was a large safe in the closet, along with robes, slippers, flashlight, umbrellas and an iron and ironing board. The bathroom featured a combination tub and shower, vanity mirror, scale, and a large selection of Kempinski amenities. We loved returning to our room at the end of the day and finding special "surprises," that included a little book on the Chinese Zodiac. Edward and I had fun reading the book to determine which was our Chinese Zodiac animal. We thoroughly enjoyed the Executive Floor Lounge where we started each day having breakfast, had Afternoon Tea when we returned from sightseeing, and had a cocktail in the evening chatting with the other guests. We used the Business Center to check the Internet, and found the Butler Service to be genies that were always ready to grant our every wish. I love to swim, and I enjoyed beginning each day swimming laps in their very large rooftop indoor heated swimming pool, where I could look out the walls of windows and "sightsee" while swimming. Energized after swimming, I went to the fully equipped fitness center and used the "fly" machine, and then ran on the treadmill looking out the window at the Beijing city traffic and felt like I was running in the marathon. Actually, I was in training for my version of the Ironman Competition: swimming, running, weight training, and most importantly, shopping in Beijing! Feeling healthy and fit, perhaps I will try out for the Olympics 2008, then again, probably not. The hotel also has tennis and squash courts, aerobic classes, whirlpool, sauna, and solarium, and offers massage. Other features of the Kempinski Hotel Beijing Lufthansa Center include upscale boutiques, a bookshop, bank and ATM machines, 24-hour medical center, dental clinic, barbershop/beauty salon, and Beijing Lufthansa Shopping Center. If the hotel seems like home, it really is for some fortunate people, as the hotel also has an office and apartment building complete with pretty gardens, a miniature lake, playground, and Montessori school for children. The hotel is located in the highly desirable business and diplomatic quarter of Beijing and is only 20-minutes from the Beijing International Capital Airport. When it was time for us to leave, we returned to the airport in style in the Kempinski Hotel Beijing Lufthansa Center chauffeured Mercedes. 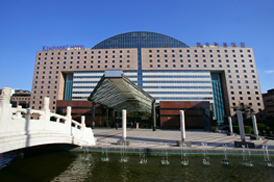 Read the other articles on the Kempinski Hotel Beijing Lufthansa Center in the Restaurants, and Chefs Recipes sections.